There are 11 Assisted Living Facilities in the Lake Placid area, with 3 in Lake Placid and 8 nearby. The average cost of assisted living in Lake Placid is $1,800 per month. This is lower than the national median of $3,346. To help you with your search, browse the 69 reviews below for assisted living facilities in Lake Placid. On average, consumers rate assisted living in Lake Placid 3.9 out of 5 stars. Caring.com has helped 5 families in Lake Placid find high-quality senior care. To speak with one of our Family Advisors about assisted living options and costs in Lake Placid, call (855) 863-8283. Lake Placid is known as the Town of Murals for the forty murals painted around the town. It has a sizable senior population, with around 18 percent of residents aged over 65. Lake Placid has three assisted living facilities, and a further nine in nearby communities, including Sebring and Zolfo Springs. Assisted Living Facilities (ALFs) in Florida are licensed and monitored by the Agency for Health Care Administration. These facilities are designed to provide personal care in a home-like environment and can receive a Standard or Specialty license. Specialty licenses allow facilities to offer limited nursing, limited mental health or extended congregate care. Weather in Lake Placid remains warm all year. In summer temperatures hover around 92 degrees and in winter the January low averages 48 degrees. There is generally no snow, although the average rainfall of 47 inches is higher than the national average. Seniors who enjoy the outdoors will like Lake Placid's 255 days of sunshine each year. Lake Placid's cost of living is around 12 percent lower than the national average, although the driving factor of this is the low cost of housing. The cost of health care is on par with the rest of the country, and the cost of groceries and transportation is slightly higher than US averages. Florida has no state income tax, so all income from social security, pensions and retirement accounts remain in your pocket. Sales taxes are close to the national average, but exemptions include groceries and medicines, two large expenses for seniors. The Lake Placid area is home to world-class medical facilities, including Florida Hospital, Lake Placid, in the event of medical emergencies or illness. Community transportation in Lake Placid is organized by MV Transportation Inc and provides door-to-door transportation services to eligible seniors. The overall crime rate in Lake Placid is 50 per 1000 residents, making it one of the highest crime rates in the United States. The violent crime rate is slightly higher than the Florida average, however, property crime occurs at a rate of 45.15 incidents per 1000 residents, which is significantly higher than the Florida average of 26.87. Assisted Living costs in Lake Placid start around $1,800 per month on average, while the nationwide average cost of assisted living is $4,000 per month, according to the latest figures from Genworth’s Cost of Care Survey. It’s important to note that assisted living rates in Lake Placid and the surrounding suburbs can vary widely based on factors such as location, the level of care needed, apartment size and the types of amenities offered at each community. 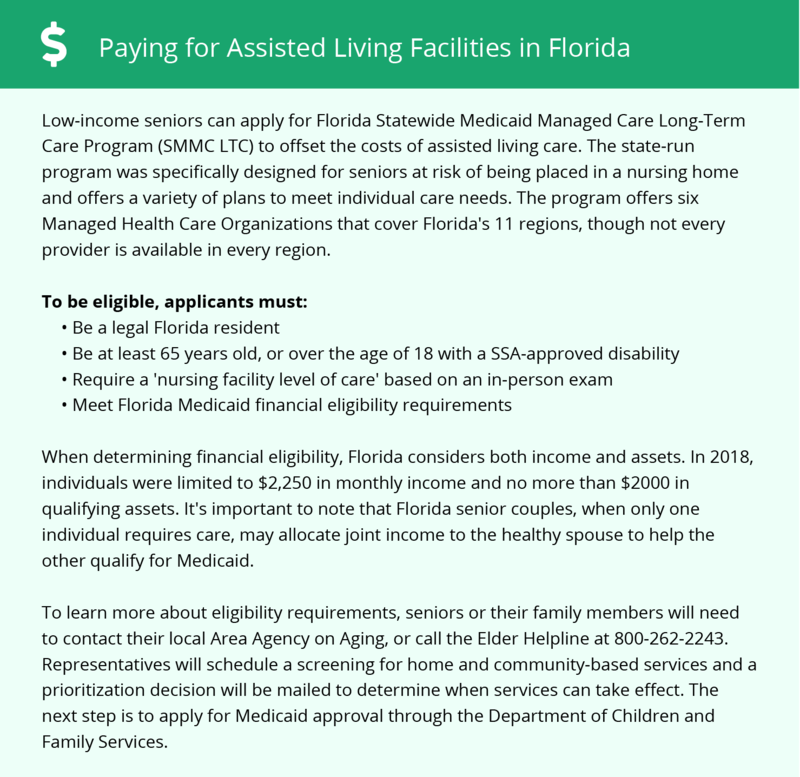 Seniors in assisted living facilities in Florida may be eligible for funding through the Medicaid Long Term Care Program or the Assistive Care Services waiver. Seniors receiving Social Security income may also be eligible to receive the Optional State Supplement. To see a list of free assisted living resources in Lake Placid, please visit our Assisted Living in Florida page. Lake Placid-area assisted living communities must adhere to the comprehensive set of state laws and regulations that all assisted living communities in Florida are required to follow. Visit our Assisted Living in Florida page for more information about these laws.